In today’s business world, eCommerce holds great growth potential for both B2B and B2C businesses. This makes choosing the right provider a critical operation. 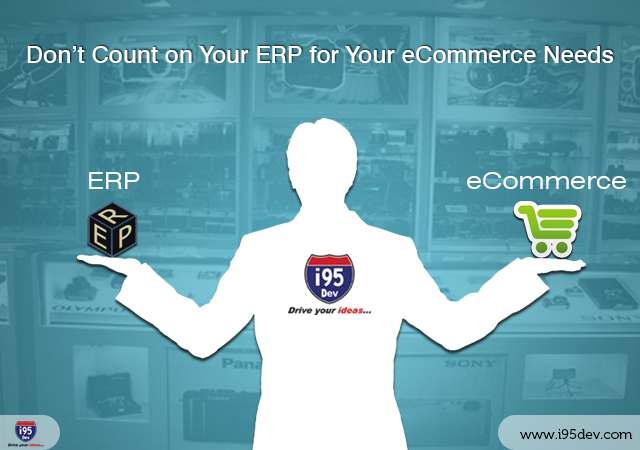 Because your enterprise resource planning, or ERP, needs to be implemented into your eCommerce, it may be tempting to reach out to your ERP provider for your eCommerce needs. ERP Providers are great with ERPs, but they do not typically have the expertise to help with eCommerce. Even though you want to simplify things by using one provider, it is more beneficial for your business to use an eCommerce specialist. ERP Providers want to draw in as much of your business as possible. They do this by expanding their offerings, often including eCommerce, creating a seemingly simple solution. Unfortunately, you need to make sure your eCommerce solution properly integrates with your ERP, as well as the other systems you use. An ERP provider may tell you an eCommerce solution only involves creating a catalog and inventory, but your eCommerce solution should be flexible and customizable to best fit your needs. You want your eCommerce Solution to allow you to sell through a variety of channels, not just through your website. This is why you need to work with a specialist, not your ERP provider. Just like you wouldn’t see a general physician for a heart problem or cancer, you shouldn’t settle for your ERP provider. They can’t give you the robust customer experience you need. You want a solution that sells through every channel you wish to use. The right eCommerce provider should offer you a great customer experience, including comprehensive site searches, side-by-side product comparisons and user reviews. Likewise, you want to provide your customers with the most accurate information updated in real-time, especially in regard to backorders and order tracking. You deserve a custom look that will separate your eCommerce site from the sites of your competitors. This is because the look of your site will have an impact on how customers perceive you. Odds are an ERP provider will use generic templates to create your site, leaving you to look the same as every other site they have created. The only thing that changes is the colors and the images or logo. Finding a separate provider for your eCommerce will give you a unique look designed exactly to meet your specifications and tailored to best meet your needs. ERP providers often limit the promotional strategies you are able to use. When you work with a company that specializes in eCommerce, you will gain the advantage of numerous options to enhance the performance of your online commerce. This includes social marketing, adding a blog, analytical tools and more. Without the use of these tools, you will lag behind your competitors, giving them the advantage instead of taking the advantage for yourself. Some vendors, including SAP, Oracle, Netsuite and INFOR, already have eCommerce modules, while others, such as Microsoft Dynamics and SAGE, are looking for options. This means more vendors will be reaching into this area, resulting in more ERPs that sell a full package. This may be a great move for ERPs, it isn’t always the right choice for retailers and merchants who want a perfect solution. Instead of turning to your ERP, then, it is best to evaluate the benefits and disadvantages of turning to an ERP provider for eCommerce. Before you turn to your ERP for your eCommerce solution, take a good look at your needs and how you need your eCommerce solution to mold to meet those needs. The eCommerce experts at i95Dev encourage business owners to closely evaluate all their options to find a provider who can offer the functionality they require. i95Dev is a Next Generation eCommerce provider that has successfully integrated eCommerce solutions with ERPs for many years for some of the biggest brands in the world. With our knowledge of market trends, you can count on a job well done. Contact us at 301 760 7499 or visit our website to learn more about our eCommerce solutions and how they integrate with your current Microsoft Dynamics ERP.